Slowly but surely, Montecito might be getting closer to a new Miramar. 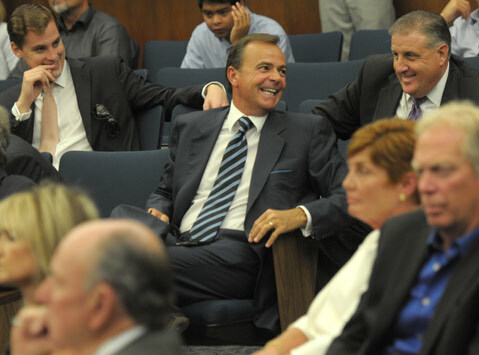 At the urging of Miramar property owner Rick Caruso ​— ​and with his project specifically in mind ​— ​the county is moving forward with an ordinance that would provide an avenue of rebate for those developing luxury hotels in the unincorporated parts of Santa Barbara County. Caruso has said such a move would help make his project ​— ​a 186-room beach club and spa with a $170-million price tag ​— ​more attractive to potential financiers. If finalized, the new hotel incentive program would give the developers 70 percent of the bed tax generated by the hotel for 15 years. The county would get 20 percent for general programs, and the last 10 would be used to promote tourism. Developers would have a four-year construction period, after which the rebate period would begin whether the hotel was open or not. In Caruso’s case, the deal would be worth at least $15 million throughout the life of the rebate. Matt Middlebrook, executive vice president for Caruso Affiliated, said the resort would be a positive for all hospitality ventures. “We strongly believe the opening of the Miramar will bring more attention to Santa Barbara County,” Middlebrook said. As Caruso and his people are quick to point out, the Miramar currently generates no sales or bed-tax revenue, and little property-tax revenue, which amounts to about $568,000 a year. Once the hotel is up and running, county officials estimate property tax will be bumped to $1.7 million, sales-tax revenue will increase to $1.5 million, and bed taxes will bring in $450,000. Concerns were raised about a lack of ordinance language requiring prevailing wages or hiring area construction workers for projects ​— ​since the point is to spur on the local economy ​— ​but three of the supervisors were ready to move forward with the ordinance regardless. First District Supervisor Salud Carbajal said those issues could be ironed out when a developer comes to the board with an application. For Caruso ​— ​who again lauded the oceanfront spot as a “spectacular piece of property” that he remains committed to building ​— ​he must now apply to the program, once the ordinance becomes official. From there, the board will have the discretion to deny or allow the rebate specifically applied to the Miramar and then set out the terms. Once adopted, Caruso has promised he will demolish the old, decrepit buildings that have sat on the property, vacant since it closed 12 years ago. The demolition benefits not only the community but also Caruso, whose permits would then not expire because substantial work was being done of the property. Caruso ​— ​known for several commercial projects in Los Angeles but attempting his first go at building a hotel ​— ​is the third person to own the property since it was shuttered. Since 2007, when he bought the property, he has slowly made his way toward construction. He is quick to note the downturn in the economy, which happened around the same time he received the county’s approval of his project. On Tuesday, he said he was happy with the supervisors’ latest decision and was ready to move as quickly as the county could. “Every project has difficulties; this one has been difficult,” Caruso said, adding that he remains committed to the Miramar. The supervisors, in a separate move Tuesday, directed county staff to come back with proposed language for a potential ballot measure ­— which would require a simple majority to pass — that would increase the bed tax from 10 percent to 12 percent. The funds would go to general programs. The supervisors will make a decision on whether to put the measure on the November ballot this Tuesday.